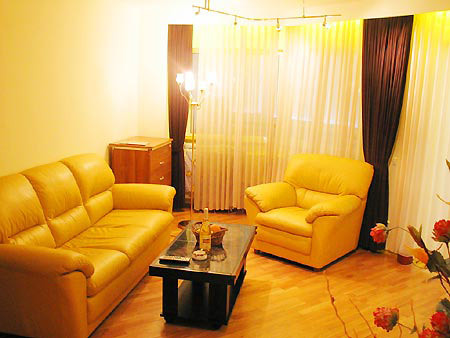 EastComfort offers accomodation in Bucharest apartments. So if you need to arrange corporate housing, book a holiday apartment or short-term accommodation for a business project in Bucarest you have come to the right place. The Decebal Blvd, RENTED FOR LONG TERM!!! An open living room area, snug bedroom and sitting room, an entrance hallway, two fitted bathrooms and kitchen, balcony. 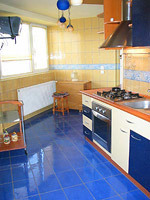 This luxury apartment is the proof of our main concern, the best temporary accomodation. It comprises 3 laminate floor rooms (80sm). The wide living room is designed with trendy furniture (leather sofa and armchairs, coffee table, full sized bookcase) and high-techs (cable TV, air conditioning, lightspots). The entire flat has natural light from the large window and the open balcony. The intimate bedroom consists of a full sized bed, armchairs, mirror wardrobe, wall brackets, while the living-room can suits both office or leisure activities, being furnished with fold-out velvet sofa, desk, book shelves and ergonomic chair. The comfort is also enhanced by airy dine-in kitchen (TV set, gas cooker, fridge and furniture). 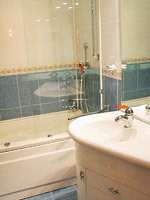 The two bathrooms are enriched with the newest type of jacuzzi (bathtub and shower cabin), beside the usual fittings. Definitely, it is a better choice than a hotel! Well-placed in a lovely area and in a new bulding, it offers good accomodation in Bucharest and easy access to every interest location: bars, posh restaurants, banks (the BCR Center), useful public transportation routes.